James Wesley Marsters (born August 20, 1962) is an American actor and musician. 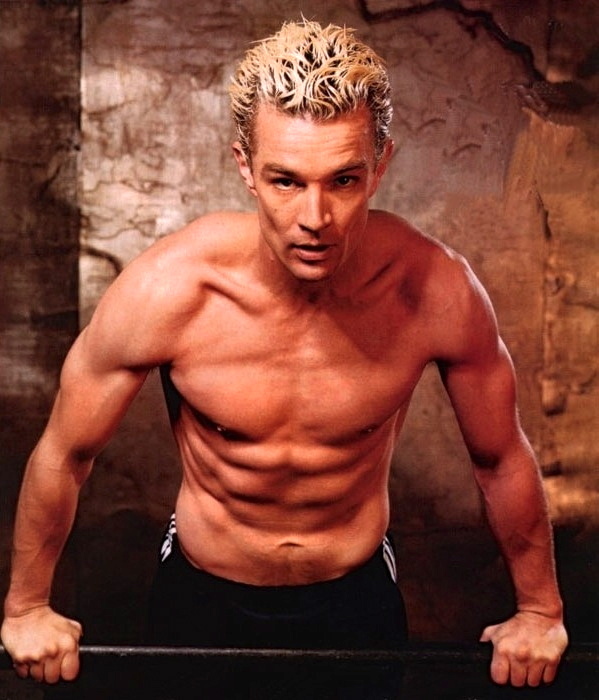 Marsters first came to the attention of the general public playing the popular character Spike, a platinum-blond yobbish English vampire in the television series Buffy the Vampire Slayer and its spin-off series, Angel, from 1997 to 2004. Since then, he has gone on to play other science fiction roles, such as the alien supervillain Brainiac on the Superman-inspired series Smallville, the omnisexual time traveller Captain John Hart in British science-fiction show Torchwood, and terrorist Barnabas Greeley in Syfy’s Caprica. Marsters appeared in a supporting role in the 2007 movie P.S. I Love You. He appeared as a recurring character in the first season of the revival of Hawaii Five-0. Marsters is neither platinum-blond nor English (nor yobbish, nor, of course, a vampire); hey, it’s a role. Apparently, in SlashficLand, Angel usually (but not always) tops Spike. Well, Angel is taller, more muscular, and darker-haired than Spike, so in Gayland he’d usually be t to Spike’s b. This entry was posted on August 20, 2013 at 3:02 pm and is filed under Gayland, Gender and sexuality, Movies, Not about language, Photography, Pop culture, Shirtlessness. You can follow any responses to this entry through the RSS 2.0 feed. You can leave a response, or trackback from your own site.